There's nothing better than once in a while, spending an evening giving yourself a facial by slathering on a great face mask - especially if it's a clay based one.....even better if it's a thermal, self-heating one! 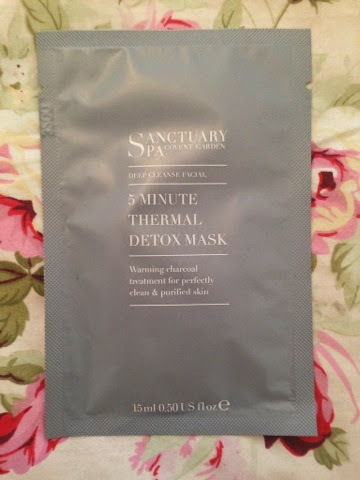 I found this Sanctuary Spa 5 Minute Thermal Detox Mask whilst browsing the beauty aisles of Boots a few weeks ago (below). As someone who often suffers has oily skin (! 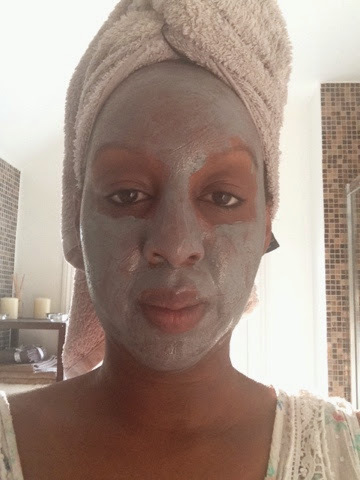 ), clay based purifying masks are a saviour. This one drew my attention for two reasons, one, because of the lovely matt grey packaging (typical fickle consumer that I am!) and two, because I was intrigued by the 'thermal' part of it's name. When I finally got round to applying this mask one evening this week, I was amazed at how warming/hot it got on my skin....I found it to be a really pleasant feeling and it reminded me of those little gel hand warmers you get, where you click the metal disc and the chemical reaction produces heat. This mask would be even more lovely to apply on a cold winters evening - its very relaxing! The directions are to apply a thin layer to cleansed skin and leave for 5 minutes before rinsing off. The theory behind the self-heating part is that it helps to open pores which allows the charcoal and kaolin clay to draw out impurities from deep within the skin. As you would expect with a clay based mask, this product as well as purifying, is also said to rebalance the skins oil levels, clarify and leave skin with a silky touch. What I liked in particular about this mask is that it doesn't dry to a hard finish, where you feel your skin pull and tighten. You just wash off after the 5 minutes, I used a cloth for extra exfoliation which is also recommended. I felt that my skin looked brighter afterwards and it was indeed super soft. I haven't noticed yet any other improvement, but I have only used it the once so far - recommended use is twice a week. Because you apply only a thin layer, I estimate that I will get at least 3 more applications from this 15ml sachet which is a handy size for when travelling. The price of this sachet is currently £3.00 (correct at time of writing). I haven't purchased Sanctuary Spa skin care products before. I tend to sometimes receive a bath gift pack from their range at christmas from at least one family member, but what I like about their products is that they really do give you that 'spa-like' feel for home with their pretty packaging. I'll see how I get on with this mask, the heat sensation is definitely a winner for me....if it can control the dreaded T-Zone shine than it will be my next beauty must have!